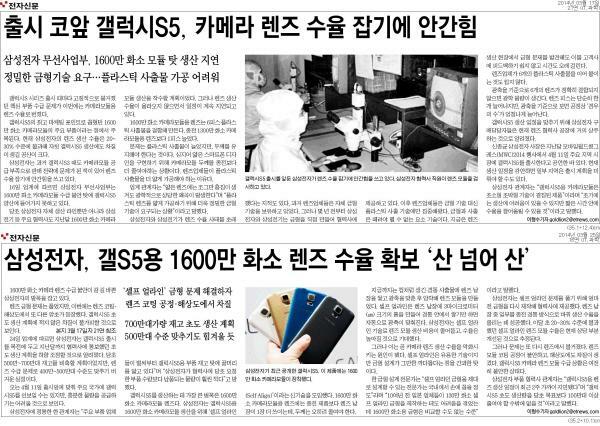 Samsung has sued Electronic Times for 300 million KRW (about $284,000 US) regarding its reporting related to the company's new Galaxy S5 phone. According to a report by the Korean language MediaToday (machine translation), Samsung is taking issue with negative reports related to the Galaxy S5 camera. Samsung alleges the news source published incorrect information, while the news site appeared to defend its reports, stating that "the story fits the facts" and was not a "false alarm." Samsung expressed concerned that unflattering reports might cause customers to hesitate before buying its new flagship model during the critical launch quarter, and just as the company is seeking to placate investors concerned about the previous Galaxy S4 failing to meet its sales expectations. Apple has similarly faced a barrage of negative reports that targeted every model of iPhone it introduced, including a number of ridiculous claims that were hysterically false, yet broadly syndicated by the tech media. Apple did not bring lawsuits to silence the reports, however. For example, in 2007 Nomura analyst Richard Windsor stated that the original iPhone had a faulty screen film that involved "a chemical deposition to provide touch sensitivity based on heat," and claimed the film would catastrophically fail after a few months, requiring a massive product recall. The iPhone didn't use any sort of film, nor was its touch screen ever heat-based. Rob Enderle used his Enderle Group brand to promote the idea that Apple's novel Slide to Unlock feature would result in women getting raped because they couldn't make an emergency call easily enough, back in the days when Slide to Unlock was considered a new invention and not community property, in the days before Samsung began its efforts to appropriate it. The next year Windsor claimed that Apple's second iPhone 3G used a faulty Infineon baseband chip that would eventually fail and cause massive product recalls, another prediction that was entirely false. His warnings coincided with other reports targeting the iPhone 3G antenna, which were subsequently disproven. iPhone 4 was famously the center of a controversy branded "AntennaGate" or "DeathGrip" by its proponents, who alleged that the signal attenuation that every other handset maker had documented in written warnings to their customers was actually an entirely new problem that had only ever affected Apple's phone. But rather than suing the media over false reports, Apple called a press conference to explain the situation and offered customers free cases to mitigate the issue. Record-setting sales of Apple's iPhone 5 were falsely dismissed as disappointing at the launch of what has become the world's top selling smartphone. When Apple relaunched the phone as iPhone 5c in a colorful case, the media again attacked it as being a flop, failure and mistake despite the middle tier phone's ability to outsell all BlackBerry phones together, all Windows Phone sales from every vendor globally, and even Samsung's top selling Galaxy S 4 flagship during the critical holiday quarter. The false reports that harassed every iPhone release didn't seem to have significant impact on sales, as Apple continued to expand its market share and beat sales records with every new model.